You need a Demat account to start trading in the market, but what about a trading account? Do you have to open a trading account too? Let's find out. With the decision of investing in the share market comes the exhausting process of fulfilling formalities to be able to start trading. You need a Demat account to start trading in the market, but what about a trading account? Do you have to open a trading account too? Why would you need to open two accounts to serve a single purpose? 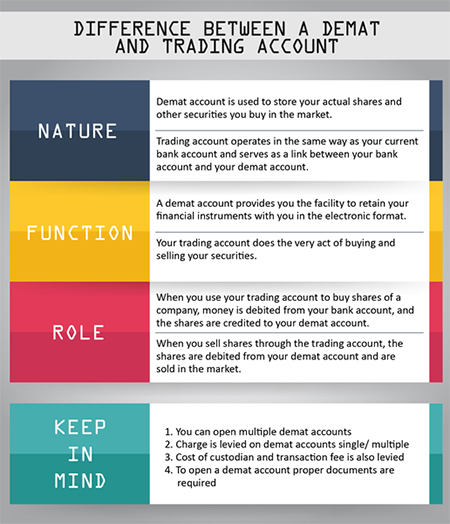 To help you understand the importance of a Demat and a trading account and whether you will need to open one or both the accounts, let us consider the difference between the two accounts. Demat accounts are used to store the actual shares and other securities you buy in the market. It is an account which works in the same way as your savings bank account. On the other hand, a trading account operates in the same way as your current bank account and serves as a link between your bank account and your demat account. Its only work is to sell your shares in the market after 'withdrawing' them out of your demat account. Thus, while a demat account works as a storage facility for your securities, a trading account is required when you want your shares in the stock market. A demat account provides you the facility to retain your financial instruments in an electronic format. This account can also be used for the re-materialization of securities (changing the nature of your securities from electronic to physical). Your trading account, meanwhile, performs the very act of buying and selling securities. Shares are debited from your Demat account and are sold in the market through the trading account. If you are only trading in futures, options, and currencies, you don't need a Demat account. Only a trading account is required to deal in these asset classes. But if you wish to invest in the stocks and shares of a company, both demat and trading accounts are a necessity. When you use your trading account to buy the shares of a company, money is debited from your bank account and the shares are credited to your demat account. When you sell shares through the trading account, the shares are debited from your demat account and are sold in the market. The proceedings from the sale are then credited to your bank account. Thus, to trade in the share market, both demat and trading accounts are required. One can open multiple demat accounts with a one depository participant (DP), as there is no limit on the number of demat accounts you can open. The DP levies an annual maintenance charge to maintain a demat account. If you hold multiple such accounts, you would have to incur a maintenance fee on each and every account. Cost of custodian and transaction fee is also levied on the investor. To open a Demat account, you will need the proper documents like the PAN card/Passport/Aadhaar card, etc., but for opening a trading account, all you will need is a Demat account. With technology taking over, opening demat and trading accounts has become a matter of minutes.